As a business owner, you have to manage a lot of complicated tax issues. It is important that you hire a qualified accountant or tax lawyer to help you manage your responsibilities or you might make a costly mistake that could lead to enormous taxes and penalties. One of your biggest tax obligations will be paying the employment taxes of your employees. You not only handle taking out taxes that employees owe from their checks, but you also pay towards their tax obligation yourself. The more employees you have, the more costly this obligation can be. Many businesses have tried to get around this obligation by classifying their workers as independent contractors instead, making the workers responsible for paying their own taxes. The employer gets off the hook for those employment taxes, and the worker actually has to pay more for self-employment tax. Or does the employer get off? The trouble is that some businesses unfairly (and illegally) classify some workers as contractors when they are really employees. Later, these businesses get a rude awakening when they get a letter from the IRS saying that they owe back taxes, penalties and interest for these employees. Employers who are told that they owe back payroll taxes have two options: They can get partial relief through a reclassification program, or they can work with a tax lawyer to file a challenge under Section 530. The IRS introduced the voluntary classification settlement program (VCSP) in 2011, allowing some employers to prospectively treat workers as employees and avoid any retroactive assessment of taxes. Employers who join this program are able to pay a fraction of the previous tax liability and avoid paying any penalties. Those who do not qualify for the VCSP and those who want to challenge their tax obligation can try to file for relief under Section 530. This section of the law allows for tax relief for employers who feel that they had reasonable basis for treating workers as independent contractors. If employers are successful in their Section 530 challenge, they are relieved of obligations for FICA contributions, taxes for the Railroad Retirement Tax Act (RRTA), federal unemployment taxes, federal income tax withholding, and other general provisions related to the collection of employment taxes. Those successful in this challenge also avoid any interest or penalties related to these taxes. The IRS must consider whether Section 530 relief would apply to a case before collections are initiated even if the employer does not raise this objection. However, this does not always happen, and some examiners may disagree on the interpretation of the eligibility for this relief. That’s why it is so important for businesses to work with a qualified tax lawyer to represent their interests. To qualify for relief under Section 530, employers must have submitted all returns in a timely manner and must have qualified workers in the same way on those returns, i.e., issue a Form 1099 for each worker. The employer must have also classified previous workers in the same position in the same way. In other words, the employer must have been consistent in its application of the classification — it can’t just have suddenly decided to start treating those workers as contractors on a whim. Employers must also show that they had a reasonable basis for treating these workers as contractors, which is where having an attorney is most helpful. The attorney can make a stronger argument for why these workers should have been classified as contractors and can put together the right documentation to argue the case. More information about the specific requirements is available on the IRS website here. However, there is no substitute for IRS tax help from a qualified attorney. 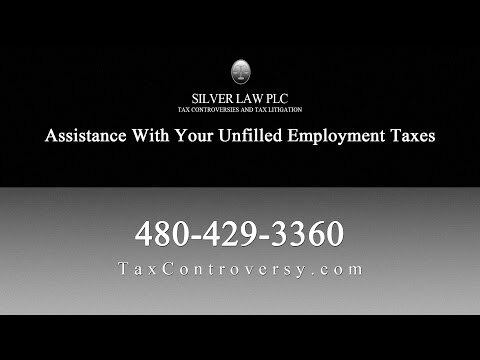 The team at Silver Law PLC in Arizona has been helping businesses get Section 530 tax relief for many years. A tax lawyer from our team can review the details of your case and help you understand if you would qualify for Section 530 tax relief or if another option would be better for your case. Our lawyers represent clients in all types of tax litigation, tax audits, collections, and more. Call our office today to talk with an experienced tax lawyer and to get the IRS tax help you need.